Sage is an aromatic, perennial herb native to the Mediterranean region which has been used as both a culinary herb and medicinally since ancient times. Marva is a heirloom Sage, you can save the seeds from this variety and they'll grow true to type. Sage leaves have a savory, mildly spicy flavour that pairs well with meats, cheeses, vegetables, breads or simply tossed through salads. Sage can be used as an ingredient in marinades, dry seasoning rubs, stuffing, herb mixes, pies and pastries. Sage is best fresh but retains most of its flavour when dried, for long-term storage of excess sage leaves use a food dehydrator and seal the dried leaves in an air-tight jar. Sage has edible purple flowers that can be used as a garnish to add colour and interest to salads and other dishes. The scent of sage leaves repel some species of moths and flies. Sage makes an excellent companion plant for brassicas, carrots and strawberries, but avoid planting it near rue, onions, basil or wormwood as they can have deleterious effects on each other. Sage flowers provide a source of nectar for and help to attract beneficial insect pollinators including bees to your garden. Sage bushes grow about half a metre tall under ideal conditions. Sage prefers to grow in a location that receives full sun. Ensure your garden soil is free draining prior to planting Sage, consider growing Sage in containers or in a raised vegetable bed if your soil is too heavy with clay or compacted. Digs lots of organic matter including well-rotted manures, compost and worm castings through your beds a few weeks prior to sowing to improve your soil structure and provide your Sage plants with the nutrients they need for healthy growth. Sage shouldn't need any additional fertiliser once established. Mulch around plants well to suppress weeds and keep their root systems cool. Sage doesn't like damp roots, allow the soil to fully dry out between waterings to avoid root rot. Sage prefers growing in slightly acidic to neutral soil with a pH range between 6.0 and 7.0. In cooler regions of Australia sow Marva Sage from October to December. In temperate regions of Australia sow Marva Sage from September to December. In subtropical regions of Australia sow Marva Sage from August to November. In tropical regions of Australia sow Marva Sage during the dry season from May to July. Sow Marva Sage seeds 6mm deep spacing plants about 40cm apart to give them enough room to grow to full size. Marva Sage seeds take between 10 and 21 days to germinate once sown. 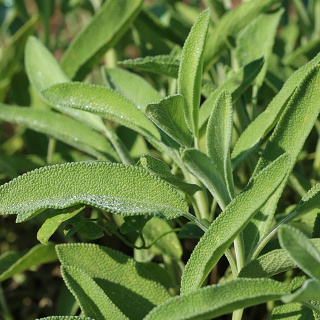 Sage plants take 1-2 years to start producing good quantities of leaves ready for harvest. One single plant should provide as many leaves as you'll need but if you want additional sage plants you can take cuttings from your first plant and these will start producing well within 4 months of planting.